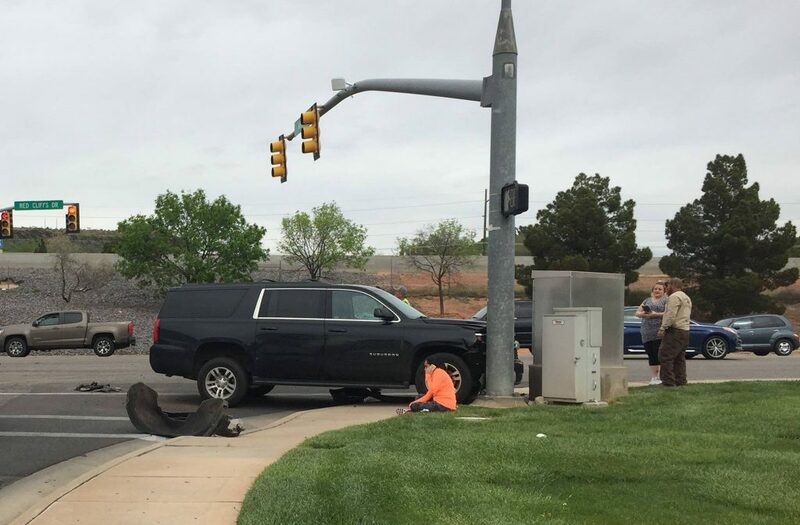 ST. GEORGE — A two-vehicle crash near the Red Cliffs Mall sent one vehicle into a traffic signal pole, injuring one person Friday morning. 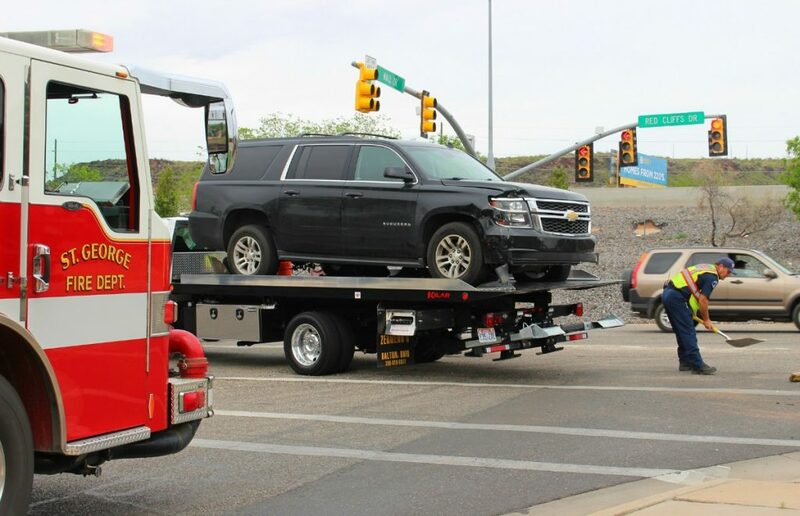 Just after 10:30 a.m. emergency personnel responded to a two-vehicle collision that was reported in the intersection of Red Cliffs Drive and North Mall Drive involving a black Chevrolet Suburban and a black Ford Mustang. Upon arrival officers found the Suburban smashed into the steel pole on the northwest corner of Red Cliffs Drive. 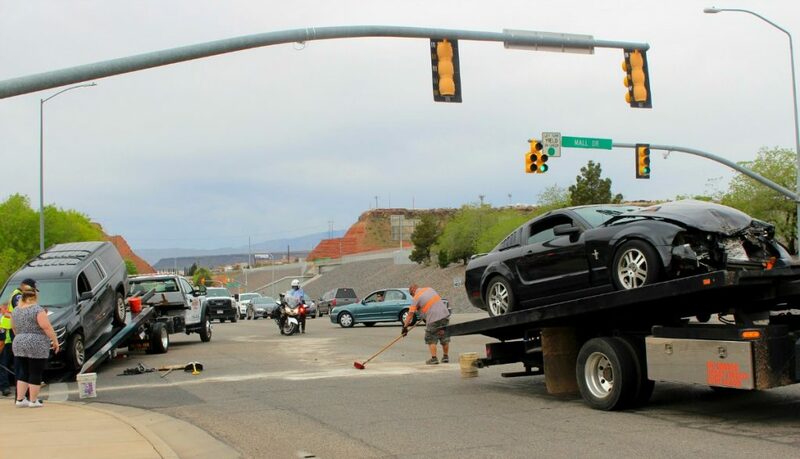 The Mustang was severely damaged and stopped in the middle of the eastbound lanes, St. George Police Officer Dave McDaniel said. Officers found the woman driving the Mustang bleeding from her nose while holding her small child who was uninjured, McDaniel said. The woman driving the Suburban reported no injuries in the crash. After speaking with the drivers officers determined that the Suburban was in the No. 2 lane heading east and was struck by the westbound Mustang whose driver turned left intent on heading south on North Mall Drive. “The light went yellow and the mustang went through with the left-hand turn, right in front of the eastbound Suburban without even looking,” McDaniel said. The impact sent the Suburban slamming into the pole and the Mustang spinning in the intersection until it came to rest blocking both eastbound lanes of traffic. The initial call to 911 reported no injuries. Once St. George Fire and officers arrived on scene the woman driving the mustang declined emergency medical care despite the apparent injury to the woman’s nose, McDaniel said. “An off-duty paramedic stopped to offer the woman aid and she declined, saying she suffered only a bloody nose and didn’t want to go to the hospital,” he added. Both vehicles were extensively damaged and towed from the scene. 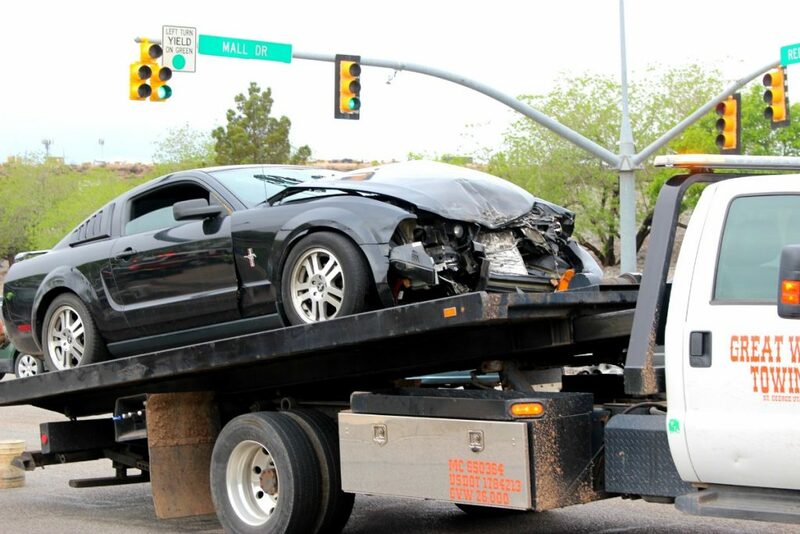 The woman driving the Mustang was cited for failing to yield on a left-hand turn. 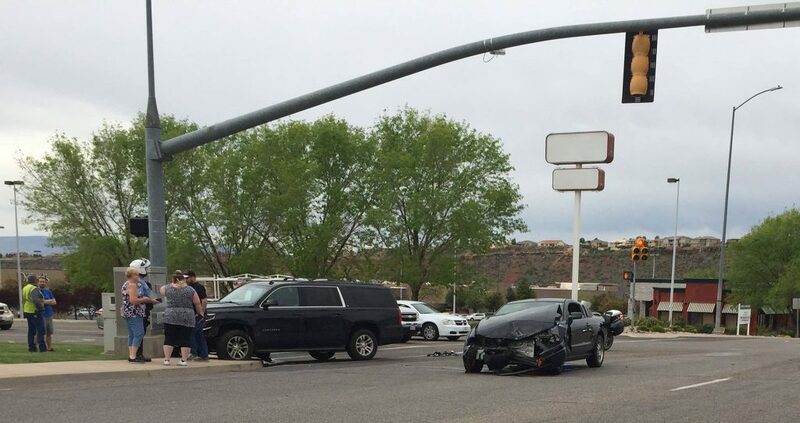 Failing to yield leads to more crashes in St. George than any other contributing factor, according to a report released by St. George Police Sgt. Craig Harding in February. “The top three causes of crashes consistently remain the same, which are failing to yield, following too close and lane travel,” Harding said. In Utah, failing to yield is the second leading contributor to crashes throughout the state, according to data retrieved from the Utah Driver’s Handbook published in 2015. Following too close – 21 percent. Failing to keep proper lane – 13 percent. Distracted driving – 9 percent. In the photo it shows a left turn light. I don’t think UDOT has anything to do with this intersection anyway since it is a city street.